Not more than 10 minutes ago I read Sarah's post about this very book over at Life in the Parsonage! I have a good, sweet friend who has been a pastors wife in the past (he's teaching now) and there's a possibility he might be a pastor again over a congregation~she's nervous for some of the same things you talked about. I would give the book to her~I may read it if first;) She wouldn't mind. I've always felt pastors wives live between a rock and a hard place. Growing up we were good friends with our pastor and his wife, she and my mom to this day are very close. Growing up I heard a little about how hard it can be for a pastors wife/family. You can't possibly please all people and yet there's so much pressure to do so. Love your honesty here and the fact that you have learned and grown. There are many things I would do and say differntly than I did 5 or 10 years ago~life is about learning along the way! What an interesting book...I was a pastor's wife for 5 years and now we have a house church in our home...but I call myself Mommy now instead of the preacher's wife as I was nicknamed then. I would enjoy reading the book then passing it along to both my mom & sister who are both pastor's wives. I am also good friend's w/2 ministry wives at our church and would give it to them. I would love to read Lisa's book. After being a pastor's wife for almost 25 years, I still don't have all the answers! Wow! 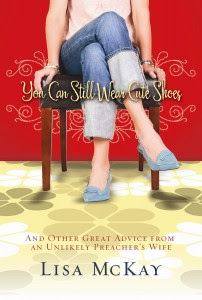 "You Can Still Wear Cute Shoes" looks like a fun and interesting read. This pastor's wife would love to win this book. It would be fun to read it and then share it with other pastor's wives. I am part of a ministry in our area called Sharing Our Journey which ministers to minister's wives. We have lots of fun fellowshiping with each other and encouraging each other in our calling. Thank you for being honest, Meredith. I appreciate knowing a little bit more of what goes on in a Pastor's wife's mind. It's interesting to me because I feel like I never even actually knew who our Pastor's wife WAS until recently. Our church is large and she just makes sure she doesn't stand out. I want to be kind to her and respect her wishes but I wondered how other P.W. 's did it. Anyway...I think your post hit on exactly what probably made you a great Pastor's Wife....your transparency. Most people just want to know that you can relate to them and to their struggles and failures. I love your blog. I love that you are REAL. I love that you are an affirming, transparent, encouraging, Jesus loving blogger. Oh my goodness!!! I just read through your comments and noticed that (I say this with the utmost serious respect in my voice) KELLY'S MOM just commented! KELLY'S MOM from His Doorkeeper...KELLY'S MOM from KELLY and HARPER!!!! Mer, I think that's the biggest! I've been enjoying your Wednesday posts that you co-write with your husband. I think you two have great insight. I'm a teacher in a Christian school and I previously worked in my home church in the office & with children's ministries. I enjoyed reading this. My mom was a pastors wife for 46 years...my dad just retired last April. She would enjoy reading this...and could probably write her own. There were often times I deeply did not want to be a PK! But looking back I can see how God used that to teach me SO much about people, leadership, and ministering to hurting people. I wouldn't trade it for the world now. It used to bother me when I was called the Pastor's Wife. I guess because, like you, I wanted to have my own person and identity and have people like me for me. I remember telling someone one time that I wasn't a Pastor's Wife but the wife of a pastor, just like one could be the wife of a plumber or contractor. Hope this comment made sense! Well, I remember you as our pastors wife- but also one of my first friends in AR! We are attending a church in a larger town now- and recently got a new pastor and his family of 5 children and lovely wife! They came from my home town Tulsa! She keeps asking me how, when & why it gets better?? We have recently had lunch together and dinner a few times. She has invited me to a Mom's retreat with her in Dallas at the end of the month...I was completely FLOORED that she wanted me to go with her? Then she told me- It was so hard to make friends as a pastors wife...and she thought we were going to be good friends! If I don't win the book- I might just go out and buy it for her. She is very sweet- and did I mention he has homeschooled all her kids ages 13-1!!! She is my hero- and I think we are going to be good friends too!! She reminds me a lot of you- sweet, sincere, and honest! Greetings from 6700'(COS)! Our church just was blessed with a new senior pastor in December. His wife and children are still in OK waiting to sell their home, so the challenging days have already started for her. This will be her first time being the wife of a senior pastor, and I'm sure she will love reading the book. I am a wife of an elder, on the women's ministry leadership team, Bible study coordinator and co-leader of a women's minstry to hurting women called Lifelines. If that qualifies me for a second entry...I'll take it!!! funny, i was so into reading this post (fascinating & deliciously honest, mer!) that I forgot that this is a giveaway... so when I saw that book I thought, "I need to get that for a certain pastor's wife I know." And then the giveaway! I don't need the book and I don't know anyone who does. I just want to say I think you were a great pastor's wife because you were REAL and you were RELATABLE! I've never been able to connect with one, never felt like I lived up to their standards. Like you said, those super spiritual people made me leery. I, too, felt they are hiding behind their religion and faith. I would love to read this book and then pass it on to someone I have known (in passing) for a couple years and just found out she was a pastor's wife! Thanks for your honesty! I really enjoyed this post...my husband served as an interim pastor for over 3 years (which I guess made me the wife of a pastor:)!) and we've served full time in collegiate ministry for going on 12 years. Thankful for God's calling and grace, and very humbled at the same time. Would love to read this book...and have some friends I would love to share it with, too! Mer, I'm not a pastor's wife nor anyone's wife for that matter. I do have a heart for women in full time ministry including pastor's wives which is why I give the magazine "Just Between Us" to folks. I'd live to read Lisa's book and pass it on. Hope my name gets drawn this time. Well, I would so love to read this book, and since we are trying to not spend in February, a win could help me get my hands on it before March. :) As you know, I am a former minister (youth and children's) married to an Associate Pastor. For the most part, I love our church/ministry life. But, I have to add that I think God's call is not only on the minister, but on his/her family as well. I know we wouldn't make it to some Sundays without HIM! How did I not know that Renae was a PK?! My favorite pastor's wives are the ones who see their main job as being a support to their husbands and children and don't think they have to be on every single committee and in every single ministry at the church. I was an MMK (minister of music's kid). I grew up thinking I wanted to marry a man in ministry. I dated a few preacher boys along the way and I was really surprised that I didn't end up a minister's wife. Ministry life was all I ever knew. I've noticed that I wherever we move, I always become really close to our pastor's wife. I think because I know what ministry life is like and because I know how to keep quiet about what she tells me, I'm a good fit as a minister's wife's friend. I can think of four sweet pastor's wives that would love to read this book. If I won, I'd just have to decide which one to send it to first!! Sounds like an interesting book, and the title is great! The wife of our former pastor would love this book, I think. She taught me that people are people wherever you go...even in a church! We are all REAL...pastors AND their wives. I am grateful for those who work in ministry to knit us together, provide leadership, and lead us to a heart of worship. I am also aware that for reasons that are unfair (and unwise!) they are often held to a higher standard of accountability in life. i am a pastor's wife - senior pastoring for the last 13 years. our ministry journey together began just after we were married with a youth pastorate, associate pastorate then seven years as missionaries in africa. i remember when God was transitioning us back to pastoral ministry wondering if it was a demotion and thinking that "pastor's wife" sounded like a dirty word. after having lived in a bush village with no running water or electricity, running thru gun fire with our toddler in my arms, being evacuated by paratroopers during civil war, the pastoral ministry is still way tougher! through this journey God's faithfulness, provision and protection has been so evident to our family - even during the rough times - it is a privilege to serve the Lord. I know how you felt about trying to be everything to everyone. I recently resigned from the Children's Ministry at our church. I loved the ministry and the volunteers but felt like I was neglecting my family and our home. i wanted to thank you for your blog! it has been used more than a few times as an encouragement, a challenge and a motivator to do what I needed to do! thank you! Being a pastors wife isn't the easiest thing to do, but it could very well be one of the most rewarding! I'm a missionary's wife. Please enter me in the giveaway. I am the wife of a preacher and I can't wait to read Lisa's book! My husband was a Worship/Music Pastor for 10 years before moving on to become a Senior Pastor nearly 5 years ago. It's funny that the title and role of "pastor's wife" didn't hit me or feel so heavy until he became a "Senior" Pastor. I didn't feel equal to the task, but I suppose that's a good starting point, huh? The book sounds really interesting--one to read and pass along. Thanks for highlighting it today! I am a preacher's kid (PK) and grew up in the ministry watching my Mom deal with the many ups and downs that come with being a Preacher's Wife. Because of her dedication, I have become the strong woman of God that He desires for me to be. So, this book would go to Momma- my role model. The book sounds like a fun read. I minister to kids and families. Those who know Jesus I focus on helping them to be intentional about their lives with Jesus. Those who don't I experience life with and work to be a trusted sounding board and resource. I want to read this book really badly. Then I would pass it on to my friend Stephanie! For my second entry, my husband is the campus minister at our big church! He is basically the "jack of all trades" guy. And we live very close to the church, so if something's going on, he's the one who gets called first! Yes Yes Yes!!! I would love this book!!! Posting twice...I'm a pastor's wife. My husband preaches at Aly Church in Southwest Ar. I'm a pastor's wife, and I am really looking forward to reading this book. Pick me! I am also a women's Bible study leader, a Sunday School teacher, and I'm trying to raise 3 girls to love God. That's my second entry! Your honesty is like a cool drink of water in a parched land. Just love your wisdom and humility mixed in with the honest truth. So good. The Lord has given me three very close and dear friends that are pastors wives. I've seen the blessings in their lives, and I've seen the painful wounds where the sheep bite. If I win, I'll have to go buy two more copies and send them each one! I am a pastor's wife and I thought your answers to the questions were great. some I would have answered the same and some different. I have already ordered this book off amazon, but if I won it, I would pass it on to one of my staff wives!! Sounds like you learned alot about being your own person as a preacher's wife - I know it isn't easy! My husband and I have been in campus ministry for 16 years and it's been a process to figure out my identity in that. Sounds like a great book! I've got a group of pastor's wives at our church I'd love to share the book with after I read it! My husband is the senior pastor at our sweet lil'church. We were in student ministry for almost 5 years and have no been in the pastorate for a little over one. This a great giveaway and I am so excited about this great book! Entering twice since I'm in ministry! :) Thanks! You were a great pastors wife...I know how hard things were on you but you were such a great support for me. Especially when Logan was born. hope all is well with you guys! Thanks for the offer! Please include me. I am a Senior Pastor's wife in Houston, Texas! Thank you so much! And, entering twice -- would love a copy for my Youth Pastor as well!! Thanks and God Bless!